Glaciers are Alaska’s #1 tourist attraction, and they’re the source of some of the absolute best Alaskan cruise excursions. From the Juneau Icefield to the far far North, tens of thousands of them cover the state. In fact, 10 times more of Alaska is covered by glaciers than is settled by humans! With so many to choose from, it’s hard to decide which ones you should make an effort to see. We’ve put together this list of 10 must see glaciers in Southeast Alaska to help make your decision a bit easier. You’ll still have some choices to make though; it’s impossible to see every glacier on this list in just 1 trip. But that just means you have to come back to the Last Frontier, right? You’ll decide which of the first 2 glaciers on our list you’ll see when you book your cruise. 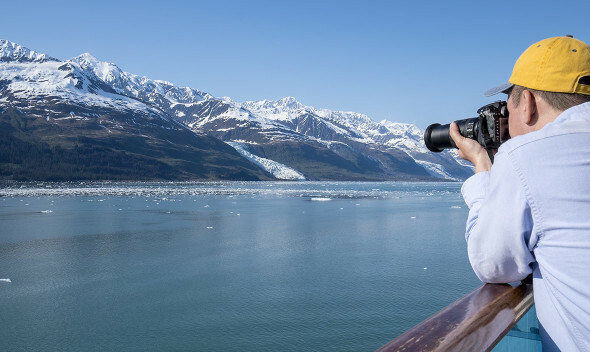 To prevent overcrowding and help with conservation, Alaskan authorities allow cruise lines to visit either Hubbard Glacier or Glacier Bay, but not both. Both are spectacular, so no worries there. Hubbard Glacier is a valley glacier that outlets near Yakutat, Alaska in Disenchantment Bay. The surging glacier has a tendency to dam off the waters of Russell Fjord on its left. The glacier closed off this waterway twice within about 15 years, causing the water levels in the resulting lake to rise dramatically. Hubbard Glacier is one of the more “active” glaciers, routinely calving icebergs the size of 10-story buildings. Most of this glacier exists below the waterline and the icebergs can appear quite suddenly, so your ship will be staying pretty far away from this one. No one wants a Titanic repeat. Glacier Bay, as the name suggests, is home to a number of different glaciers. The Grand Pacific Glacier is located at the northwestern end of the Bay and is the widest glacier in the park, coming in around 2 miles wide. Most visitors will see either Margerie or Lamplugh glaciers. The steep drop off of the Margerie Glacier means that your ship can get up close and personal with this tide water glacier. Glacier Bay is an interesting stop because you can actually view receding and advancing glaciers side by side. The glaciers of the Fairweather Range on the western side are advancing while the glaciers of the Chilkat Range to the east are receding. The Mendenhall Glacier is located in Auke Bay, Juneau, and is possibly the easiest glacier on this list to see. Multiple tour companies plus public buses run to this mountain glacier, meaning some of the best Alaskan cruise excursions can be found here. The glacier extends from the Juneau Icefield to Mendenhall Lake. The more challenging aspect of Mendenhall Glacier and the Juneau Icefield is getting close to it. The buses will drop you at the visitor center, which offers great sightseeing and Kodak moments, but you’ll have to work a little harder to actually experience this glacier. 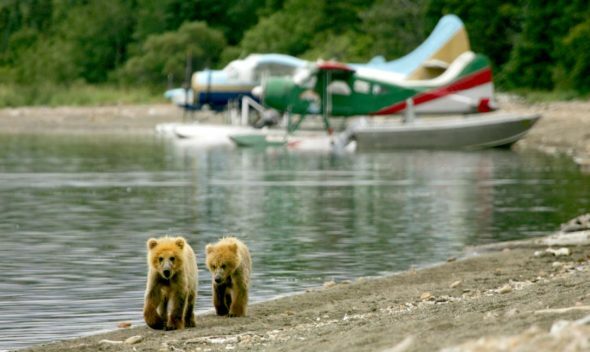 There are a couple of options among the best Alaskan cruise excursions to Mendenhall. Our favorite is the the Mendenhall Glacier Trek, a full-day adventure for active travelers. A second choice is the self-guided kayak tour, though this one is limited to those with previous kayaking experience. Laughton Glacier is a great stop for getting out on a glacier without taking a flightseeing tour. However, it does require you to lace up your hiking boots and commit most of the day to it. The hike to Laughton starts from mile 14 of the White Pass and Yukon Route Railroad stop. During the summer, WP&YR offers flagstop service to both Laughton and Denver glaciers. The hike itself is not very difficult, rising only about 200-600 feet over 3-5 miles and making for what active adventurers find to be among the best Alaskan cruise excursions. One of the nicest parts about Laughton Glacier is that you can spend as much time on the glacier as you wish, provided you make it back to the tracks in time to catch the last train home. Denver Glacier is another hike-to glacier off of WP&YR railroad. This one starts at mile 5, conveniently marked by an awesome red caboose (which you can rent overnight if you have the time!). The Denver Glacier is a hanging glacier, so the hike won’t actually get you on it. This glacier hike, one of the best Alaskan cruise excursions for nature lovers, is more about the journey through one of the last remaining old-growth forests. If you’re interested in getting on the glacier, you’ll have to check out one of the glacier dogsledding tours in Skagway. The Davidson Glacier outside of Haines is an awesome valley glacier that originally extended all the way into the Lynn Canal. It’s receded as of late but still cuts an impressive picture as you cruise the Canal towards Skagway. The glacial flow extends back through the Chilkat mountains until it merges with ice flow that forms Glacier Bay on the opposite side of the landmass. One of the more exclusive glaciers on this list, Davidson glacier is only accessed by 1 tour: Glacier Point Wilderness Safari. But that’s a very good thing, because the exclusivity of the tour means that there is more interaction with the glacier than most other tours offer. It’s one of the most popular shore tours options and, its numerous happy guests would suggest, among the very best Alaskan cruise excursions. President Harding is the only president to ever visit Skagway. Perhaps that’s because shortly after his visit he died of an apparent heart attack. The mountain directly opposite Skagway’s harbor was summited near his visit and renamed Mt. Harding. The hanging glacier attached to the peak became Harding Glacier. Harding Glacier is another untouchable, but has excellent, easy photo opportunities. This glacier can be viewed from the town of Skagway, but is best seen heading up the Klondike Highway towards the White Pass. The largest of the Juneau Icefield Glaciers, Taku Glacier is a tide water glacier. Its claim to fame is being the deepest and thickest glacier known to man. The glacier is over 4800 feet thick! Taku Glacier also happens to be one of the few advancing glaciers left in the world and the only advancing glacier of the major glaciers in the Juneau Icefield. This one is simply breathtaking in its enormity. This Juneau Icefield glacier can be seen from Taku Inlet, which is reached on an airboat with the Taku Glacier Adventure. The Herbert Glacier, another Juneau Icefield example, is about 5 miles north of the Mendenhall glacier and can actually be reached in a number of ways. Several helicopter flightseeing tours go to Herbert, as well as a glacial dogsledding option (in my opinion one of the best Alaskan cruise excursions!). If you’d rather use your own paws, there is an easy 9-mile roundtrip hike that will take you to the flood plane. There’s no easy way up onto the ice, but the views from the flood plane make for great photos. Lemon Glacier is also located in Juneau as part of the massive Juneau Icefield. It is about 5 miles from downtown Juneau, and if you’re really brave you can hike the Lemon Creek trail. It’s 4.3 miles of mud, stinging nettles, cordouroy log sections and washouts. We don’t recommend it. If you’re not feeling brave, your other option for this glacier is a flightseeing tour. 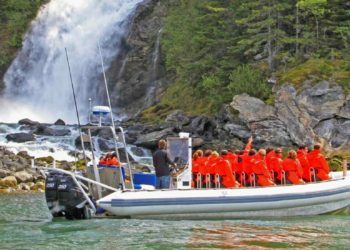 These tours, which lots of guests consider to be among the best Alaskan cruise excursions, get you up close and personal with either the Herbert, Lemon, or Norris Glaciers and are a great way to experience Alaska’s wilderness, no hiking required. This list is nowhere near exhaustive, but is a good start when planning your Southeast Alaskan cruise. The best way to see Alaska’s glaciers is to get yourself out there. Pictures just don’t do it justice. Did we miss a glacier you love? Let us know in the comments.